IMPORTANT NOTE ON SAVING & CHECKPOINTS: Checkpoints are the spots in each level where the game auto-saves. These are noted in blue and numbered in the walkthrough text to correspond with PC, Macintosh, PSP & Wii savegame files available for download. (Please note that the number and location of checkpoints vary slightly for the Nintendo Wii game.) 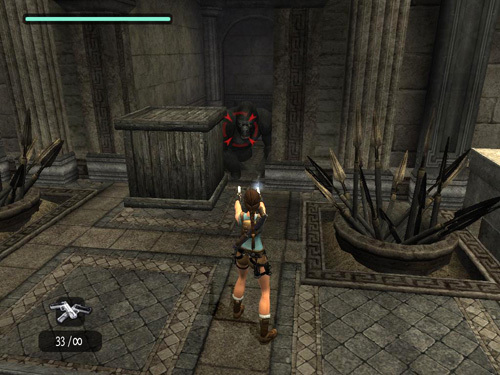 Although it is also possible to save manually, the save system in Anniversary is very different from the older Tomb Raider games and differs in several ways from the TR Legend save system. Please see the Anniversary Controls page for details. This may save you a great deal of frustration as you make your way through Lara's latest adventure. Once you've dealt with the apes, take a look at the statue. Notice the gold bar set in one of the small rectangular receptacles. Notice the three empty receptacles. Looks like you've got some work to do. FIRST DOOR SWITCH: Turn around and head back toward the entrance. Climb onto the small block just to the left of the doorway (when facing it) and climb up onto the little fountain. (You could do this to avoid the gorillas when first entering, but one of them tends to hide behind this fountain making it hard to hit from above.) From there, use the handholds to reach the ledge above. Pick up the large medipack near the corner and pull the switch to open the big door below on the opposite side of the room and trigger CHECKPOINT 2. ROOM WITH SPIKES & COLUMNS – FIRST LEAD BAR: Cross CHECKPOINT 3 and enter a large room with low, square columns and clumps of razor-sharp spears. High on the right wall is a wide alcove with something shiny on a pedestal. There's a smaller raised alcove in the far right corner, a doorway straight ahead, another wide alcove with a lever above on the left and a fourth alcove with some white rocks and a metal ring in the near left corner. Grapple the metal ring and pull the stones down. Now you'll be able to get into that alcove later. Cross to the far right corner of the room (from the entrance) and find a box of shotgun ammo between the angled column and the light-colored one with the flat top. Then go through the doorway opposite the entrance. There's a closed gate at the top of the stairs. To open it, pull the wooden crate away from the doorway below and to the right of the stairs, enter the alcove and pull the switch to open the gate. In the Nintendo Wii game, instead of the switch, there's a cryptex puzzle. Pull the crate away from the alcove and about halfway along the wall beside the stairs. Climb onto the crate to reach the carving with the clue to the puzzle. Press Interact to examine it, use the brush to clean away the dust and the charcoal to make a rubbing of the clue. The three symbols, from top to bottom are: Psi (Y), Pi (P) and Omega (W). Hop down, go into the alcove that the crate had been blocking and access the puzzle. Turn the bottom cylinder once to the left. Then turn the top cylinder three times to the right. (The middle cylinder moves when you turn the top one.) This should align the symbols correctly, opening the gate at the top of the stairs. Leave the crate, at least for now, and head up the stairs. On the way up, get the small medipack on the landing. Then continue upstairs to the lever but don't pull it yet. In the Wii game, this lever is not visible at first. Instead there's a gear puzzle. Pick up the COG from the floor and fit it into the panel. Rearrange the cogs so they all touch and pull the switch to raise the lever from the floor nearby. Do not pull the lever yet. Pulling the lever will raise the square pillars and also extend several ledges in the big room. Once extended, the pillars and ledges will enable Lara to reach the various raised alcoves. Notice how some of the pillars have flat tops, some are angled, and others have metal grates on top. When these pillars extend, spikes pop up from the grates, making the pillars impossible to cross except by hanging by the edge and traversing around them. When Lara lands on any of the flat-topped pillars or protruding ledges, they start to retract, so you'll need to move across them fairly quickly. The sloping pillars do not descend right away, so you need not hurry to reach them. The metal-topped pillars with the spikes also don't retract immediately, so you can take your time crossing them. If you're not interested in obtaining the artifact and relic in this room, you can skip those parts and go right for the LEAD BAR (below). If you don't manage to grab the rising pillar in time, or miss grabbing the ledge, just save the game manually and reload at CHECKPOINT 4. This places Lara near the lever with the pillars just starting to rise. Immediately jump down to the dark block and try again. Or, to reset the pillars, jump onto—or grab the edge of—any of them. Drop to the floor and all the pillars will begin to retract. Then return to the lever and pull it once more to raise them. NOTE: If you're finding the climb to the artifact difficult, it may help to take the wooden crate that you moved to access the gate switch and pull/push it out into the room with the pillars. 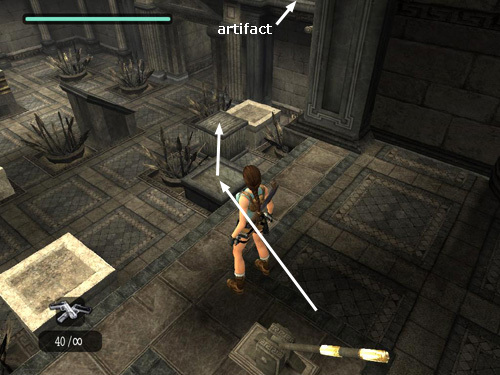 Then move it up against the light-colored column near the artifact (as shown in this screenshot). Then you can jump from the low block to the crate and then to the column. RELIC #1: Return up the stairs to the lever and pull it once more to raise the pillars. This time you're headed for the alcove in the far left corner of the room. (These screenshots show the alcove and how to reach it. You can also watch the whole sequence in this video walkthrough.) Once the pillars are fully extended, take a running jump to land on the right side of the first flat-topped pillar. It starts to descend immediately, so turn left and take a running jump to grab the top edge of the spiked pillar. Do not try and pull up. Instead, climb around to the other side of the pillar and on to the right as far as you can. There's no need to hurry since the spiked pillar won't start sinking yet. Jump back to land on the sloping pillar near the wall. Slide just a little and jump to grab the protruding ledge. It begins to retract as soon as Lara grabs it, so quickly pull up. Run across the ledge, veering slightly to the left (toward the wall) as you go, and jump to grab the edge of the alcove containing the relic. It's a long jump, but if you press the Jump button right at the edge of the ledge and hold Jump while Lara is in the air, she'll make it. She'll catch the ledge with only one hand, though, so quickly press Interact to do a saving grab. Traverse to the right, climb up and take RELIC #1 (3/8), the Athenian Owl Figurine. CHECKPOINT 5 registers here. Drop down from the ledge, again watching out for the spikes below, and return up the stairs to the lever once more. NOTES: Other walkthroughs suggest using the wooden crate that you moved in order to reach the gate switch to prop up the angled column nearest the RELIC. This prevents the column from sinking all the way, allowing you to jump from it to the ledge. But I prefer the shorter method described above, which was suggested to me by several players. I have included instructions for the longer method on a separate page in case you want to try it. The video also covers the long route. If you'd like to learn more about the real-life inspirations for objects like this owl figure, Tomb Raider Horizons publishes a fascinating series called "Arte-Factual," which covers art and artifacts from all the TR games. FIRST LEAD BAR: Pull the lever again to raise the pillars and trigger CHECKPOINT 6. This time you're headed all the way across the room to the alcove on the opposite wall. (The sequence is shown in these screenshots.) 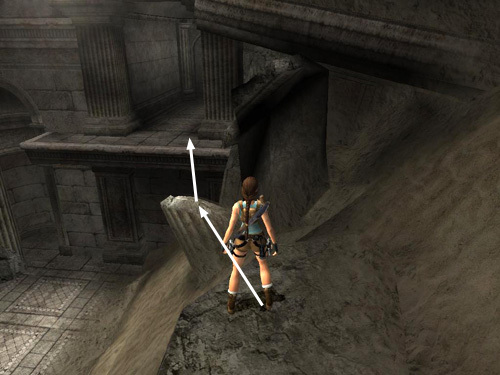 Begin by repeat the series of jumps you used to reach the protruding ledge on the way to the relic (above). After pulling up onto the ledge, instead of running forward toward the alcove, turn right and take a running jump to grab the spiked pillar ahead. Lara may grab the top of the pillar but if she misses and grabs the horizontal crevice partway down, just jump up to grab the top. While hanging from the spiked pillar you can take your time. It won't retract yet. Climb to the right around one corner then the next. Do not go all the way to the next corner. 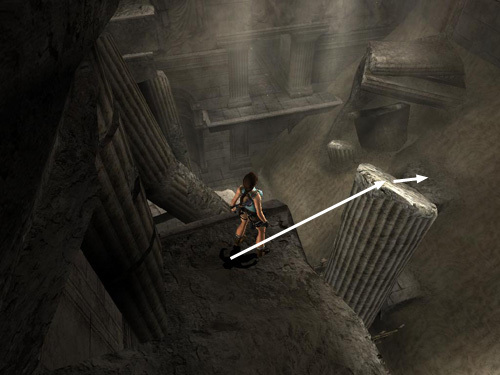 Instead, position Lara near the left side of the pillar and jump back to land on the flat-topped pillar behind. It starts to descend, so tap the HUD key to center the camera behind Lara. Then immediately run forward and jump at the edge to land on the sloping pillar ahead. As Lara starts to slide, jump again to grab the end of the protruding ledge ahead, which begins to retract. Quickly pull up, turn left and take a running jump onto the next protruding ledge. This one also starts to move back into the wall, so pull up, turn left and take a running jump to grab the top of the spiked pillar ahead. Now you can take your time again. Climb to the left all the way around to the back of the pillar. Position Lara as close to the left edge as she'll go. Jump back to grab the narrow horizontal shelf on the pillar behind. As it starts to sink, quickly jump up to grab the top of that pillar and then pull up. Turn right and take a running jump into the alcove. Take the LEAD BAR from the pedestal. This is CHECKPOINT 7. Drop down and return through the doorway where you entered, past CHECKPOINT 8, (same as 3), and down the hallway toward the MIDAS STATUE ROOM. On the way, you'll meet 2 more gorillas. Don't let them corner Lara in the narrow corridor. Run/jump past them into the open area near the pool and, if you like, climb up in front of the statue to shoot them from safety. CHECKPOINT 9 is in the entrance to the statue room. MIDAS STATUE ROOM - SECOND DOOR SWITCH: Climb the handholds on the left side of the statue to get up behind it. Pull the switch on the back of the statue to open the second big door down below. Climb up onto the ledge above the switch to get some shotgun shells. Drop down on either side of the statue and go through the door you just opened. ROOM WITH HUGE CENTRAL COLUMN – SECOND LEAD BAR: CHECKPOINT 10 registers as you enter the hallway. (Again, Wii players will find the flashlight useful in this darkened hallway.) Continue to CHECKPOINT 11 at the top of the stairs. There's another flight of stairs on the right, which leads to a higher opening. Ignore that for now and enter the room ahead. You can see the next LEAD BAR behind the fence in the middle of the room, but you can't reach it yet. Head for the far left corner of the room and go down the stairs. A gorilla and lion tag team waits in the room below. When you reach the bottom of the stairs, turn right and you'll be able to target them as they charge toward Lara. You can then run back up the stairs to safety. They won't follow, but neither will they stand there and let you shoot them. You'll have to come down and draw them out several times in order to kill both creatures. Or, just run past them into the room so you have more room to maneuver as you fight. When the room is clear, use your grapple to pull the metal rings on each of the three wooden supports surrounding the central column. When the supports are removed, the base of the column crumbles, dropping another LEAD BAR onto the pedestal. Take it and return upstairs the way you came. ROOM WITH HUGE CENTRAL COLUMN – FULL OF SAND: When you removed the supports from the central column, the ceiling collapsed, filling this room with sand. The exit is above on the left, but the sandy slopes are too slippery to climb, so you can't reach the exit directly. Instead return across the room to the entrance, turn left and go up the stairs you passed earlier. Follow the hallway to the end. Pick up the shotgun ammo in the alcove on the left and then move into the opening to trigger CHECKPOINT 12. Look out over the sandy room to spot and kill 4 bats before they reach Lara. NOTE: If you miss any of these jumps and slide down the slope, you can either return up the stairs to the opening or save manually, reload at CHECKPOINT 12 and try again. If you have trouble with the lateral jump from the wall run, you can take a slightly longer alternate route: Grapple the metal hook. Then wall run across and jump to grab one of the handholds to the right (as indicated by the broken arrows in the previous screenshot). Climb to the right from handhold to handhold and then jump back to grab the dangling rope. 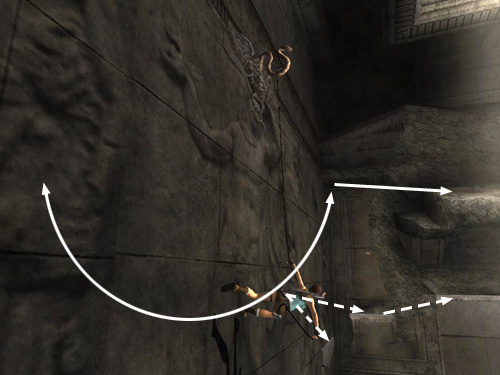 While hanging from the rope, climb down to the bottom (Interact + Down) but not so far that Lara loses her grip and falls off. Turn to face the fluted column near the wall. (The handhold from which you just jumped should now be on Lara's left.) Swing, jump and grab one of the horizontal cracks on the column. Climb to the highest crack, move to the left as far as you can and jump back to grab the jutting ledge behind, which is CHECKPOINT 13. Pull up and turn around. Now, you can take a rather complicated side trip for a small medipack or proceed to the exit. If you don't want the medipack, skip the next two paragraphs and simply jump from this broken column to the next one and from there to the exit (as shown in this screenshot). To get the medipack, turn around and jump to grab the crack on the right side of the center column. (These screenshots show where to go.) Climb around to the right and jump back to land on the flat spot behind. Cross the broken floor to the left wall and grab the lower handhold. Climb to the right and jump to grab the handhold above. Climb to the right again and jump to grab the top of the lower of two huge blocks. Climb up onto the higher block. Turn right, take a running jump and grapple the metal hook above. Extend or retract the cable if necessary so Lara's feet are just above the doorway. Wall run back and forth and then jump onto the ledge to the right on the far side of the room. Climb up into the alcove, get the small medipack (circled in the picture) and hop back down onto the ledge. Turn to face the exit (below the metal ring), jump toward the wall and slide down the slope into the doorway. NOTE: If you're having trouble with the wall run above, review the technique in the Damocles section of St. Francis Folly or Artifact #7 in Croft Manor. CHECKPOINT 14 registers in the doorway as you exit. Follow the twisting hallway back to the MIDAS STATUE ROOM. There are 2 gorillas waiting at the end of the hall. (In the Wii game, this hallway is pitch black until you get close to the end. There's no danger until after you pass through the dark area, though.) When you see the bluish reflection of water on the wall ahead, you'll know you're almost there and should watch out. Run past the apes onto the ledge with the pool. Just be careful not to jump off the edge or you'll have to save and reload or make a very long trek back to this point. I found that the gorillas generally don't bother Lara if she stands on the low ledge near the switch. NOTE: Many players report having trouble reaching the ledge with the third door switch. You cannot do this directly from the MIDAS STATUE ROOM. You must go through the ROOM WITH HUGE CENTRAL COLUMN where you find the SECOND LEAD BAR (as described above) in order to reach the ledge with the switch. MIDAS STATUE ROOM - THIRD DOOR SWITCH: After killing the 2 gorillas, pick up the 50-caliber pistol ammo to the left of the switch. Then use the switch to open the door on the high ledge behind the Midas statue (and trigger CHECKPOINT 15). To get down from the ledge without taking any damage, jump into the square pool. Climb out of the water and make your way back up the handholds on the left side of the statue to the ledge behind it. Go through the door you just opened. Pass CHECKPOINT 16 and follow the hallway to the end. FIRE PILLAR ROOM – THIRD LEAD BAR: CHECKPOINT 17 is just inside. Head for the left wall and go down the steps to the water. Take a little swim to draw out a crocodile and quickly climb out at the base of those same steps—near the wall where the bottom step is low enough to reach—and shoot the croc. NOTE: This crocodile does not appear in the Nintendo Wii game. Hop in the pool again and swim past the submerged circular pillar to the side of the wider pillar beyond, where you'll find an underwater lever. (This screenshot shows the spot.) Pull it to raise the stone tower on top of this pillar, revealing some rough chinks that will serve as handholds. Swim back to either set of stairs and climb out of the water near the entrance. Walk out along the center ledge above the pool. Step on the square pressure pad to trigger the pyrotechnics. At this point, you may want to take a few moments to observe the way the burners work. The round pillar ahead has a single burner that cycles on and off. The wider pillar beyond it on the right has a ring of smaller burners that ignite and go out in a counterclockwise pattern. NOTE: If you don't mind cheating a bit, it is possible to explore most of this room without triggering the flames. Details on this are included in a footnote at the end of the walkthrough in case you want to try it. ENTRANCE TO FIRST SWITCH: (The following sequence is shown in a series of screenshots.) You're headed for the alcove high on the right, so take a running jump to land on or grab the nearest round pillar. As long as Lara hangs or stands close to the edge, she won't take damage. Wait for the flame to turn off and then take a running jump across the top of the pillar to grab the jutting edge of the larger pillar with the ring of burners. NOTE: Unlike the corresponding area in Tomb Raider 1, you can get through all of this without Lara actually catching on fire. If she takes heat damage, just use a medipack and go on. As Lara hangs from the edge, watch the burners. When the one in front of you goes out, pull up and follow the flames around to the right. If you pace yourself, each burner should go out before Lara gets to it. On the back of the column is a series of handholds. Grab the lowest one and quickly jump up to grab the second then the third before Lara gets toasted. Climb around to the left as far as you can and then jump back to grab the ledge jutting out from the alcove behind. Pull up. Cross the alcove and use the switch to raise the submerged pillar—another round one with a single burner—and trigger CHECKPOINT 18. In the Nintendo Wii game, there is a cryptex puzzle here instead of just the plain switch. The clue is located on the floor in front of the lock. Press Interact to examine it. Use the Wii remote to brush away the dust and make a rubbing of the carving: Omega (W), Psi (Y), Omega (W), from top to bottom. Activate the puzzle on the wall and turn the bottom cylinder once to the left. Turn the top cylinder once to the right. Then turn the middle cylinder once to the right to solve the puzzle. FIRST SWITCH TO SECOND SWITCH: (These screenshots show the next sequence.) Face out across the pool. Take a running jump along the jutting ledge on the left to grab the middle-level horizontal crevice on the tower. Climb around to the right as far as you can. When the burner directly below goes out, drop to the crevice below, then to the ledge with the burners. Turn right and take a running jump to grab or land on the single-burner pillar you just raised. As long as Lara hangs from or stands right at the edge, she won't get burned. When the flame starts to subside, run across the top of the pillar and jump to grab the narrow ledge below the lion-head flame jets on the pillar ahead. When you grab on, Lara will be hanging below one of the jets. Climb around to the left until Lara is hanging below the next flame jet. Jump back to land on the small square block. Jump to grab the ladder on the wall and climb to the top. Use the switch to raise a stone tower on top of the second wide pillar with the ring of small burners around its base. CHECKPOINT 19 registers afterward. Again, the Wii game has a cryptex puzzle here instead of a switch. Examine the carving on the alcove floor, brush away the dust and make a rubbing of the inscription. From top to bottom it reads: Omega (W), Sigma (S), Psi (Y). Approach the puzzle and press Interact to examine it. The bottom symbol is already correct, so leave that one alone. Turn the top cylinder once to the right. Then turn the middle cylinder once to the right to solve the puzzle. NOTE: If you've come to this walkthrough after pulling the third switch (below), then the switch in this alcove will already be in the down position, and the second tower will already have been raised. It's OK. You won't get a save point here, but you can continue to the LEAD BAR then the RELIC by following the walkthrough as written below. SECOND SWITCH TO LEAD BAR: (These screenshots show the path from the switch to the alcove with the LEAD BAR.) Stand in the opening above the pool and grapple the ring on the left side of the pillar with the metal bars and flame jets on its sides. It helps to stand in the middle of the ledge, not on the bit that juts farther out, in order to hook the ring. Pull it to turn the entire top of the column. Grapple the second ring, which should now be where the first one was before you pulled it, and pull that one to turn the top of the pillar as far as it will go. Now a section of the pillar with no flame jets should be facing the alcove. Take a running jump from the jutting edge of the ledge and grab onto the pillar. Then climb to the top and turn left to face the tower you just raised with the switch. Watch the ring of burners and when the nearest one ignites (as shown in the screenshot above), take a running jump to land at the base of the tower. By the time Lara lands, the flames should have moved off to the left. If your timing is off and the burners in front of you ignite, step back and hang from the straight edge (as you did before with the first tower) until the flames move away. Then pull up, run to the left and quickly grab the lowest horizontal crevice on the tower. Immediately climb up to the second. Now you'll need to carefully time your passage past each lion-head flame jet. Begin by inching to the right so Lara is nearly at the corner where this facet of the tower meets the next. Then, when the flame starts to go out, quickly climb to the right. Keep the camera directly behind Lara and tap Interact as you go to climb faster and you should be able to get past it without little or no damage. Repeat the process for the next flame jet. Now move almost to the right edge of this facet of the tower. Watch the flame jet above. As it starts to go out, jump straight up to grab the horizontal crevice above and quickly climb to the right before the flame ignites. Now Lara should be hanging from the highest handhold on the tower with her back to the alcove. Jump back to land inside. Pick up the large medipack on the far side of the alcove. Then take the LEAD BAR from the pedestal, triggering CHECKPOINT 20. Dive into the pool and return to the room's entrance, crossing CHECKPOINT 21. NOTE: It's a good idea to do a manual save here. Then if you miss any of the next tricky jumps, you can reload at CHECKPOINT 22 instead of having to trek all the way back to the entrance, then the alcove. THIRD SWITCH & TIMED RUN TO THE RELIC: Pull the switch in the alcove to further raise the tower above, revealing the relic in a rough niche on the side of the tower. CHECKPOINT 23 registers and you have about 45 seconds to get to the relic before the tower retracts again. After pulling the switch, watching the cut scene and waiting for CHECKPOINT 23 to register, you'll have about 45 seconds to get from the switch to the relic. I highly recommend saving your game manually. Then if you don't make it, you can reload at the checkpoint, pull the switch and try again, without having to repeat the whole wall-run business. NOTE: You'll cross CHECKPOINT 24, which is actually CHECKPOINT 17 again, but don't bother saving your game. If you reload here, the tower will have retracted and you'll need to climb all the way back to the third switch to try again. Also, when making the following jumps from pillar to pillar, try to take off right at the edge each time, so you land on the next structure, rather than having to grab and pull up, which wastes precious seconds. Take a running jump from the pressure pad to the first round pillar. Veer to the right a bit as you keep running across the top of the pillar. Jump at the edge to land on the first tower. Do not wait for the lit burners to move off. If Lara has to run through the flames, hopefully you'll have enough extra health packs to take care of her. Run to the left across the base of the tower and jump to the second squat, round pillar. Run across the top of it to grab the pillar with the metal bars and flame jets. Climb around to the left (tapping Interact to go faster) until you reach the back, where there are no flame jets above. Don't climb all the way to the left, just far enough to clear the metal bar above. Jump up four times to reach the top of the pillar. Turn left and take a running jump down to the base of the tower with the ring of burners. Run around to the left and press Interact to grab RELIC #2 (4/8), the Griffin-Head Protome, from its niche before the tower retracts. If you don't get there in time, reload your manual save from CHECKPOINT 23 and try again. Or, if you didn't save at the switch, drop into the water, swim back to the entrance and repeat the process as described above. NOTE: For more info on the real-world counterparts to the Griffin-Head Protome and other Tomb Raider collectibles, check out the Artefactual series from Tomb Raider Horizons. USEFUL BUG IN WII VERSION: If you're playing the Nintendo Wii game and are having difficulty with the timed run, try this trick, sent in by Todd. After throwing the third switch take your time swimming back to the entrance. Wait for the column with the relic to lower. Then step on to the pressure pad and back off it. When you step onto the pad a second time the column with the relic rises again. Because the initial swim/run part of the timed task is behind you reaching the relic in time should be much easier. Once you have the relic, drop into the pool and swim back to the entrance once more. Follow the hall back to the MIDAS STATUE ROOM. Another pair of gorillas meets you near where the hall splits and converges again. Run past the gorillas, across CHECKPOINT 25 (same as 16), and into the open room. If you want to, you can climb up and shoot the apes from the safe ledge above the switch. You should now have THREE LEAD BARS. If you're missing any of them, check the walkthrough above and go find the one(s) you need. Then return to the statue. OPENING THE EXIT: Climb down on either side of the statue and approach Midas's hand. Stand next to it and press Interact to place one of your lead bars in its palm. The lead is magically transmuted to gold. Press Interact again to take the GOLD BAR. Repeat the process until you have THREE GOLD BARS. Use one in each of the empty niches on the front of the statue—one on the level where the magical hand is, two on the base below. The niche nearest the hand already has a gold bar in it. When all four niches have been filled, the gate at the bottom of the pool opens and the level ends. NOTES: If you didn't try climbing up onto Midas's hand earlier, I recommend doing that now. When the game reloads you can move on without losing much time at all. In the Wii version, the levels are laid out the same, but the transition from Midas's Palace to the Tomb of Tihocan occurs a bit later. 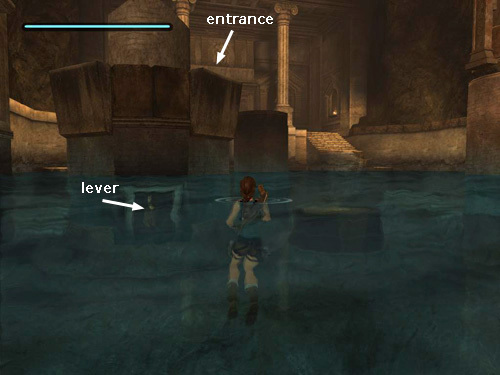 Jump into the pool and proceed through the underwater tunnels, as described in the walkthrough for the next level. When you reach the room with the movable crate, the new level starts. †UPDATE HISTORY: 6/17/07 - First draft of walkthrough posted online. 6/18/07 - Added PC savegame files for the checkpoints after obtaining the first and third lead bars. 6/22/07 - Fixed a couple of silly typos. 11/05/07 - Made a number of major and minor revisions to this level and added a bunch of new screenshots. Added the trick for exploring the fire pillar room without turning on the flames. (Thanks to Jesse and Milla for their suggestions, which helped me develop the strategy described here.) Also added shortcuts in both the room with spikes and columns and the sandy room with the central pillar. These were based on suggestions sent in by a number of players. They are all credited below. 2/8/08 - Added Nintendo Wii edition info. 2/11/08 - Changed the numbering system for artifacts, relics and rubbings, as explained in the note below. 3/20/08 - Fixed incorrect puzzle sequence for first cryptex puzzle in the fire pillar room, thanks to Gigon. 4/29/08 - Added Macintosh save files and info. Thanks to Andrew W. and Chris H.
5/16/09 - Tried to clarify the section about placing the gold bars in the niches since the first version was causing some confusion. 10/11/09 - Added videos for all relics. 9/5/11 - Added the note about the Midas-Tihocan level transition, which occurs a bit later in the Wii game. Thanks to Marjolein for the heads-up. 11/3/12 - Added useful bug for getting the second relic in Wii game, thanks to a tip from Todd. 8/26/13 - Added link to Tomb Raider Horizons. ACKNOWLEDGEMENTS: Thanks to the following helpful players for their contributions to the walkthrough for this level: Andy M., Anna, Annabel, Bill J., Brian K., Edwin, Eli, Frank, Jesse, Johnny B., Ken, Laura C., Marjolein, Milla, Monica, Sarah W. and Todd. *NOTE ON KILLS: There are only 15 enemies in the Nintendo Wii version of the game, since the crocodile in the FIRE PILLAR ROOM does not appear. **ABOUT ARTIFACTS, RELICS & RUBBING REWARDS: Finding artifacts and relics (formerly known as "secrets") unlocks various extras like outfits and concept art. The Nintendo Wii game also includes "rubbing rewards" in some levels. I have numbered each of these bonuses in the walkthrough. So, for example, "Artifact #2 (10/44)" means that this is the second artifact in this particular level and the 10th out of 44 artifacts in the whole game. Please see Anniversary Rewards page for more info on all of these. ***ABOUT TIME TRIALS: After completing a level, you will be able to replay it in Time Trial mode to unlock cheat codes. For more info, please see the Time Trials and Rewards pages. For help beating this level's time trial, see Eldin's Midas's Palace - Time Trial Tips. EXPLORING THE FIRE PILLAR ROOM WITHOUT TRIGGERING THE FLAMES: After killing the crocodile and pulling the underwater lever, return to the entrance. Head back along the hallway toward the MIDAS STATUE ROOM to trigger CHECKPOINT 16 again and then return to the FIRE PILLAR ROOM and CHECKPOINT 17. Save manually so you can reload at CHECKPOINT 17 if you accidentally turn on the flames while experimenting. Now, instead of stepping directly onto the pressure pad that triggers the burners, approach the edge of the pad. Then gradually move onto it by adjusting the camera angle and tapping the movement keys or left analog stick so Lara scooches forward a little at a time, stepping one foot onto the pad, then the other. The trick is to depress the pad completely with one of Lara's feet while keeping the other one on the walkway. Then, if the flames don't come on, ease the other foot onto the pad and proceed from there, jumping across to the first squat, round pillar. (The technique that worked for me is shown in these screenshots, as well as this short video). Using this technique, I was able to explore most of the room. However, I was only occasionally able to complete the timed run for the relic without triggering the flames. Here I found it easier to turn on the flames before making the timed run; otherwise the cut scene that shows the burners igniting interrupted the timed sequence and Lara usually fell into the pool. If my method doesn't work for you, you might want to try the following alternatives, suggested by other players. First, kill the crocodile, use the underwater lever, and re-use CHECKPOINTS 16 and 17. 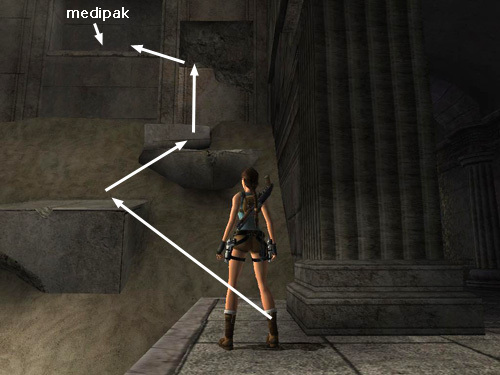 Then try either of these strategies: (1) From the exact spot where Lara starts when you load CHECKPOINT 17, do a swan dive toward the pressure pad. Lara should land on the edge of the pad and, if you're lucky, the flames will not be triggered. Thanks to Jesse for that technique. (2) Approach the pressure pad but don't step on it. Jump over the pad to land in the water beyond. Swim around to the stairs and return to the pad. Now you may be able to step on it without turning on the flames. (I wasn't able to do this one. Perhaps it works in some versions of the game but not others.) Thanks to Milla for this suggestion. IMPORTANT NOTE ABOUT SAVEGAME FILES: The PC save files linked to this walkthrough include instructions for use. Additional save files can be found on a separate Anniversary save page. Please note that my saves were made using the North American DVD version of the game. As far as I know, they are compatible with most other DVD versions and with the Direct2Drive download version. They will not work with certain unofficial versions, which use a different source code. Saves for one of the torrent versions are available on my Anniversary save page. WAS THIS WALKTHROUGH HELPFUL? If not, I apologize and invite you to contact me with any questions. If you need help right away, I recommend the Square Enix Tomb Raider Forum or any of the other message boards listed at tombraiders.net/stella/community.html. If this site was useful, please consider supporting it financially or in other ways. For details, visit tombraiders.net/stella/support.html. As always, I welcome your corrections/suggestions. Thank you! Copyright © 2007- Stellalune (). All rights reserved. The TRA screenshots and gameplay video included here were made using Fraps. Feel free to copy or print this walkthrough for personal use. By all means, share it with friends, but please include this credit line so people can send me their feedback. No part of this walkthrough may be reproduced on another site without permission.